1. More doubt cast on food deserts. The concept of a “food desert”—typically low-income urban neighborhoods where a lack of nearby grocery stores leads to poor nutrition—is widely accepted. But a new study adds to the evidence that in most cases, poor nutrition isn’t a result of food deserts; it’s a result of too little income. Part of the issue is that food deserts are often defined in relatively small areas, sometimes as little as a mile or half-mile, so even people who live inside them may not be too far from another neighborhood with a grocery store. 2. City Observatory on the Knight Cities podcast. Our own Joe Cortright sat down with the Knight Foundation’s Carol Coletta to talk about the relationship between neighborhood inequality and national inequality; why we make desirable neighborhood illegal; and what City Observatory is planning for the future. Check it out! 3. Do the rich (neighborhoods) get richer? While conversations about neighborhood change focus on relatively poor communities, it’s not necessarily the case that income growth is concentrated in those neighborhoods: In fact, evidence from studies like “Lost in Place” and research on growing economic segregation suggests that upper-income neighborhoods may be seeing faster income growth. We look at five cities—Chicago, Detroit, Miami, Philadelphia, and Portland—and check out the relationship between neighborhood income growth and how wealthy a neighborhood was to begin with. Only in Miami were poor communities consistently growing faster. 4. Election results for urbanists. This Tuesday, voters in several parts of the country went to the polls for off-year elections—and many of them voted on referenda or city council races with important implications for sustainable and equitable housing and transportation. In San Francisco, the “Mission moratorium”—which would have placed a hold on all market-rate housing development in the neighborhood—went down to defeat, while a bond issue for affordable housing was passed overwhelmingly. In Seattle, voters approved more funding for transit, and elected pro-housing growth council candidates in most races. And in Boulder, one of the most exclusionary zoning reforms in the country failed. 1. The Vision Zero movement has made lowering car speeds in urban areas a part of the urban policy conversation, and for good reason: while a pedestrian hit by a car traveling 20 mph has a 95 percent chance of surviving, those odds decrease to just 15 percent if the car is moving at 40 mph. But getting drivers to operate at safer speeds isn’t just a matter of putting smaller numbers on signs: As Eric Jaffe writes at CityLab, street design, more than anything else, determines how fast people will drive. 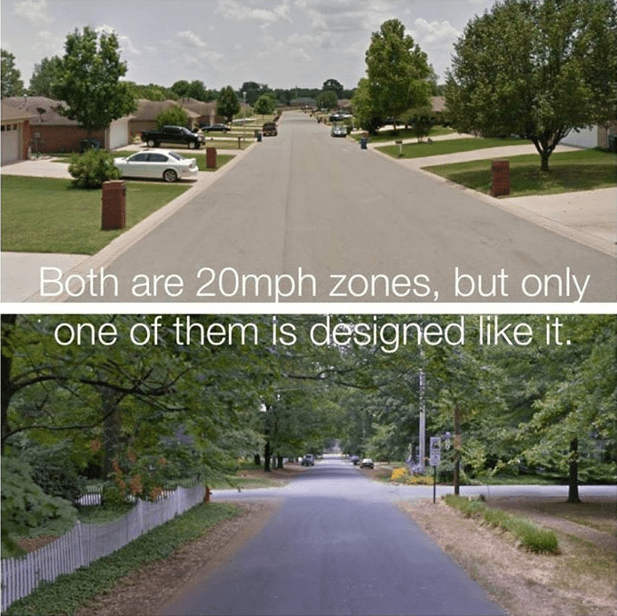 Narrower lanes, curbside trees, and tighter turns all influence people to slow down—and a 20 mph sign on a wide open street is unlikely to accomplish its goal. 2. At TechCrunch, Kim-Mai Cutler investigates the people on both sides of the fight over AirBnB rentals in San Francisco. (Proposition F, the proposed regulations, were voted down on Tuesday, hours after this piece came out.) The campaign reveals some of the odd politics of housing in the Bay Area—including the fact that many of the people leading the charge for affordable housing are in fact the benefactors of policies their opponents argue have been inflating home prices in San Francisco for decades. But neither the status quo nor the (failed) reforms of Proposition F come off looking good in Cutler’s piece. 3. In cities as different as Chicago and Houston, Chicago Magazine‘s Whet Moser points out that the numbers just don’t support the stereotype of the urban cyclist as a beareded twentysomething hipster. 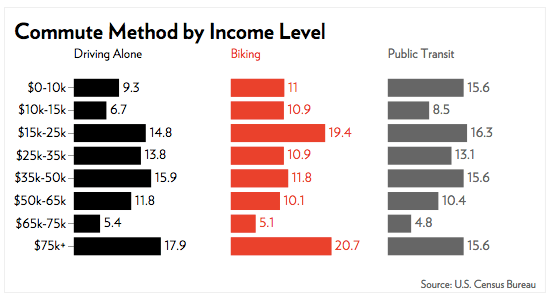 In fact, while people with upper-middle-class incomes are disproportionately likely to bike, so are people with incomes below $25,000. Research Moser cites from Rice University, as well as his own data, should dispel concerns that efforts to make biking safer on American streets is only about catering to relatively affluent white residents. Biking is a low-cost transportation alternative that’s valuable to all kinds of people. Moser’s table from Chicago is below. 1. You’ve probably heard about America’s sky-high prison recidivism rate—that more than half of people in state prisons will return to jail within five years of being released. Except it turns out that estimate is wildly inflated because of a statistical mix-up. Researchers at Abt Associates, using a wider data set, discovered that earlier estimates had over-sampled repeat offenders by a substantial margin—and the real recidivism rate is closer to 30 percent, with just 11 percent of offenders returning to prison more than once. While those numbers aren’t exactly great, they’re a far cry from older studies, and suggest that anti-recidivist efforts could be much more targeted than previously thought. 2. In a worthwhile Canadian initiative, that country’s Ecofiscal Commissionreleased a report on the importance of road pricing for reducing congestion. The Commission points out that congestion pricing (charging vehicles more money as roads become busier) can help by getting drivers to internalize the full cost of their choice to drive—including the congestion costs imposed on other drivers. (This is a theme we’ve taken up at some length before.) The study goes on to give examples of successful congestion pricing policies in Stockholm, Minnesota, and elsewhere, and then make recommendations for their implementation in Canadian cities—which could easily be applied to American metropolitan areas. 3. New research serves as a useful reminder that while “physical” aspects of walkability matter—things like frequent intersections and crosswalks, wide sidewalks, and mixed-use neighborhoods—that’s not all it takes to create a community where people actually walk. Hee-Jung Jun of Sungkyunkwan University in Seoul shows that elevated levels of social capital—the kind of community-building social ties that are one of the goals of creating neighborhoods where people can interact outside of their cars—are correlated with “perceived”walkability, but not necessarily “physical” walkability. 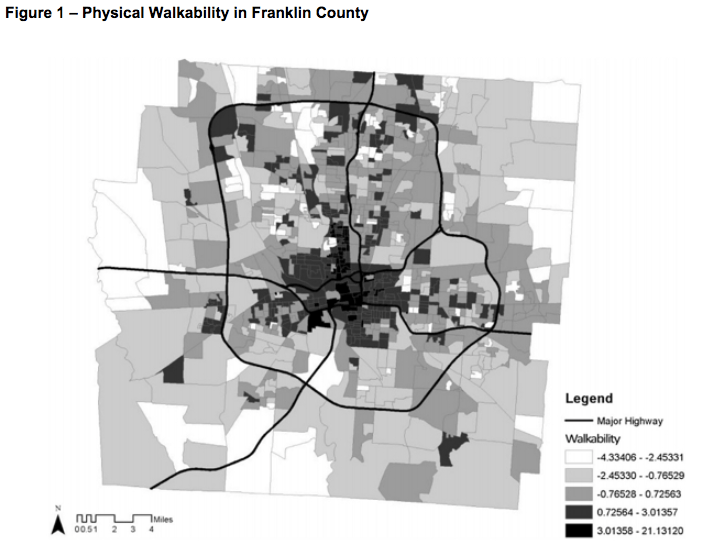 As Jun writes, “socioeconomic disadvantage is often high in the neighborhoods where physical walkability is high in the US”—that is, central city neighborhoods—and that disadvantage can translate to things like crime that make people warier of walking. Both community development that fights these issues and physical design are crucial parts of building a walking neighborhood.